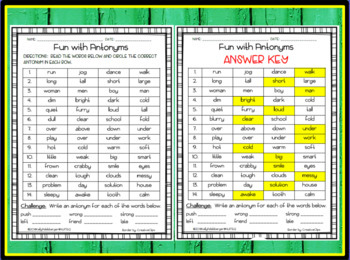 This worksheet provides practice for your students to identify the opposites or antonyms of verbs and adjectives. This worksheet contains a total of 14 questions and 6 challenge questions. Students are given a word and then have to choose the word's antonym out of three in a row. For the challenge questions, the students have to write a word for the antonym given. An answer key is provided for ease of grading! Enjoy!